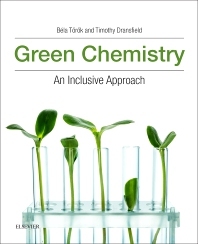 Green Chemistry: An Inclusive Approach provides a broad overview of green chemistry for researchers from either an environmental science or chemistry background, starting at a more elementary level, incorporating more advanced concepts, and including more chemistry as the book progresses. Every chapter includes recent, state-of-the-art references, in particular, review articles, to introduce researchers to this field of interest and provide them with information that can be easily built upon. By bringing together experts in multiple subdisciplines of green chemistry, the editors have curated a single central resource for an introduction to the discipline as a whole. Topics include a broad array of research fields, including the chemistry of Earth’s atmosphere, water and soil, the synthesis of fine chemicals, and sections on pharmaceuticals, plastics, energy related issues (energy storage, fuel cells, solar, and wind energy conversion etc., greenhouse gases and their handling, chemical toxicology issues of everyday products (from perfumes to detergents or clothing), and environmental policy issues. Dr Torok received his Ph.D. from the University of Szeged, Hungary in Organic Chemistry/Heterogeneous Catalysis in 1995. After receiving his Ph.D. he did postdoctoral training with the 1994 Nobel Laureate George Olah at the University of Southern California in Los Angeles working on the development of environmentally benign alkylate gasoline production. He has held various faculty appointments at Michigan Technological University and the University of Massachusetts Boston, where he is currently a Professor of Chemistry. In 2011/12 he was a visiting professor at the Massachusetts Institute of Technology working with the 2005 Nobel Laureate Richard Schrock on the development of new alkene metathesis catalysts. His main research focus is on the design of new green chemistry processes for the synthesis of fine chemicals and pharmaceuticals. The major tools applied in his research are heterogeneous catalysis (both metal and solid acid), catalytic hydrogenation, the application of aqueous medium in organic synthesis and unusual activation methods such as microwave and ultrasonic irradiation. He has published over 150 papers and book chapters, many of them in the journal Green Chemistry and Green Chemistry related books. Dr Dransfield received his Ph.D. in Physical Chemistry from Harvard University in 2002, working with James Anderson in the study of the gas-phase radical reactions of the lower atmosphere. He also did his post-doctoral work in the Anderson group studying the oxidation pathways of small organic molecules in the polluted troposphere. He came to UMB in 2004, where he has served in various faculty positions. He is currently a Senior Lecturer in Chemistry. His research blends computational chemistry with gas-phase kinetics and mechanistic studies, and the use of infrared spectroscopy to identify gas-phase and aerosol species. He has experience teaching chemistry to all audiences, from graduate students to health science majors, and has developed a keen understanding of the differing needs of different students. He has led the team-taught graduate course on Green Chemistry at UMB several times, and has overseen the integration of a wide array of topics into the survey of the field.